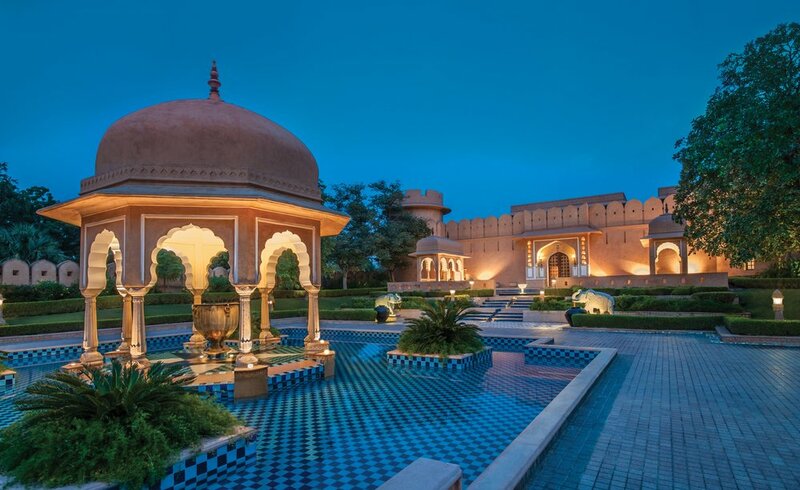 An serene oasis, this resort with its über attentive service is alone worth the journey to Jaipur. From the moment that you cross the threshold of The Oberoi Rajvilas and rose pedals cascade down upon you (yes, literally), you know that your family is about to experience an unsurpassed level of hospitality and service. My family and I have had the good fortune to stay at a number of 5-star properties around the world. And I can say with certainty that we’ve never received more attentive service than at this resort - from the extremely affable general manager, Abhishek Sharma, who made a point of getting to know us personally to waiter Sunil, who opened the restaurant early after hearing we’d missed lunch while on the road. Then there were the many gardeners and housekeepers who stopped what they were doing every single time we walked by to deliver a heartfelt “namaste” with folded hands; it’s only when we arrived at our next hotel that we realized what a difference that repeated and sincere gesture made in our stay. Now every hotel staff that we encounter will be compared to the one at the Rajvilas. Maybe it should come as no surprise that families are treated like royalty. This lush 32-acres filled with red bougainvillea, shady trees, and peacocks - so many peacocks - was once the summer retreat of Jaipur's royal family. The former haveli, or mansion, now houses the full-service spa. The original 18th century Shiva temple still sits at the center of the property surrounded by a lily-pad covered moat. Inside a chanting Hindu priest will bestow a blessing on your family in a short ceremony, if you choose. The Oberoi Rajvilas is a particularly good family choice because of all the extra programming - both cultural and fun - that it provides for kids and adults. Between the Oberoi signature experiences and the refreshing pool, your family may decide to forego sightseeing in Jaipur altogether, just to spend more time soaking in the Rajasthani warmth of Rajvilas. The rooms - more accurately, villas - at Rajvilas are arranged in small clusters around traditional fountains that are framed by canopies of native flowers. My husband and I stayed in a room featuring a king-sized, four-poster bed, ornate wood furnishings, handwoven rugs, and an inviting alcove with a comfortable sofa overlooking the gardens; outside our window, a peacock was fanning his plumage to attract the attention of the nearby peahen. Down a short hall, we found a convenient vanity, walk-in dressing area, and stunning bathroom with a white marble soaking tub and glass-paneled shower that overlooks a garden. Yes, it’s completely glass yet private. Our sons’ neighboring room was similar with two twin beds. Between the two rooms, the housekeeping staff had carefully written the word, “Welcome” in marigold pedals. KidTripster Tip: If you have small children or mobility issues, ask to be placed in a room close to the pool. Otherwise, chauffeured golf carts are available for your use. The Rajvilas features even more lavish villas with private pools in addition to luxury tents, designed for couples. All accommodations comes with complimentary high-speed internet for up to four devices. Online rates during low season start around $343/night. The Oberoi Rajvilas will only accommodate a maximum of two adults and two children (8 and under) or one child (age 9-12) in a single room. If you have two children (ages 9-12), the additional room will be charged at 50% of the full rate, but if you're traveling with two teenagers, the additional room is full price. KidTripster Tip: When planning a trip to India, be mindful of the taxes. Hotel taxes are 28%; food taxes are 18%. It really can add up. KidTripster Tip: The Oberoi Rajvilas often offers special discounts online. Like most high-end resorts, the checkered-blue pool at The Oberoi Rajvilas is a focal point. Surrounded by kneeling, pink sandstone elephants squirting water from their trunks, it’s a comfortable place to while away a few, relaxing hours. Or you can head to the full-service spa, offering a menu of beauty and relaxation treatments, including couples’ massages. Or you can work up more of a sweat at the fitness center, tennis courts, badminton court or playground. My teenagers loved playing badminton! There’s also complimentary morning yoga. What sets Oberoi hotels and resorts apart - aside from the über attentive service - is the extra Oberoi Experiences that are offered, most of them complimentary. These workshops usually are centered around topics or activities that are specific to the region - in this case, Rajasthan. The Oberoi Rajvillas has the largest selection of experiences - many specially designed for kids - that I’ve seen at any Oberoi property. My sons, ages 14 and 17, spent about 1-1/2 hours in the Young Hotelier’s Programme. The staff gave them a behind-the-scenes tour of the inner workings of the resort. Their favorite part? No surprise here, the kitchen! While they were busy, I attended the Indian spice talk. My husband? He found his way to the putting green. After several days together 24-7, it was actually nice to split up and each have our own experience. Other complimentary activities include an astrology reading, Rajasthan history lesson, and demonstrations of in-lay wood technique, miniature painting, and bangle making. Little ones will enjoy the kite decorating and flying, pottery making, and a treasure hunt around the property. Other offerings are fee-based: kids’ cooking class, puppet show, magic show, and Indian wine tasting. But we found the free offering to provide more than ample entertainment. In the early evening, take a short, guided tour of the property with a staff member. You'll see an amazing number of birds; about 50 varieties live or visit Rajvilas, including the most peacocks that I've ever seen in one spot! What to do outside of the resort? Our family had planned to spend an entire day touring the Pink City of Jaipur. But after taking one look at the resort’s offerings, my husband and younger son decided to stay at The Oberoi Rajvilas. My older son and I scaled back our list of sites to two: Amer Fort and Hawa Mahal. In retrospect, I’d only recommend Amer Fort. Fun Fact: Why is Jaipur called the Pink City? In preparation for the visit of Queen Victoria and the Prince of Wales in 1876, the city was painted pink. Pink supposedly denotes the color of hospitality, though our guide insisted pink paint was the least expensive color. For around $25 dollars for 4 hours, we arranged for a guide through the hotel. Mr. Krishna Pal Malik is not only a knowledgable guide, he's also a journalist with great insight on the city. In addition to learning about the fort, we were able to ask him burning questions that we’d had from our previous days on the road (as our driver didn’t speak English), like “why are cows sacred?” and “why do truckers decorate their rigs like Christmas trees?” Just making the 40-minute drive from the hotel to the fort was an education. Mr. Malik was able to tell us so much about the people that we were seeing just by the color of their saris. India boasts several preserved forts, but if your kids are like mine, they won’t want to see them all. 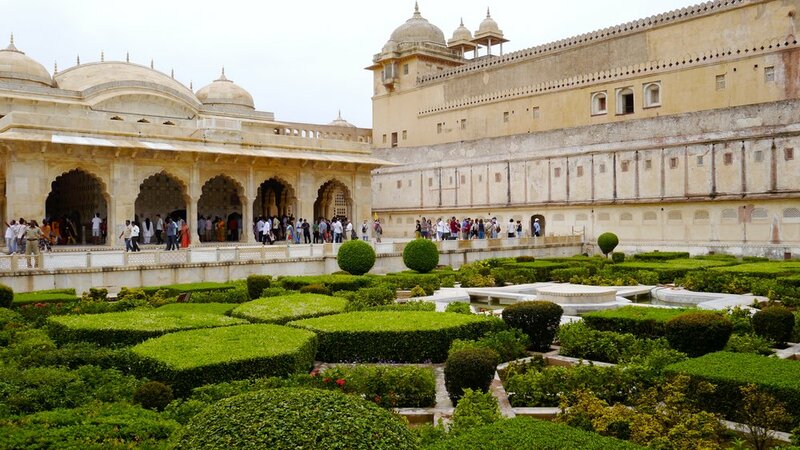 If you see just one fort in India, I’d recommend Amer Fort (also known as Amber Fort or Amber Palace), located in the village of Amer about 7 miles outside of Jaipur. This UNESCO World Heritage Site, constructed of yellow sandstone and marble, sits atop a hill overlooking a small lake. You can walk up the steep entrance to the fort or approach on elephant. I’ll be honest, I’m not a big fan of the elephant rides here; they use howdahs, or carriages on the elephants’ backs. In my opinion, it’s way too touristy. As you make your way up the stairs from the Sun Gate and main courtyard, you enter the second courtyard, the Diwan-i-Aam, where the maharaja, or king, would receive his public. You’ll immediately be struck by the opulent and colorful Ganesh Pol, which serves as the entrance to the third courtyard, the Diwan-i-Khas, or “Hall of Private Audience.” This stunning hall of decorative mirrors is where the king would entertain special guests. Pay particular attention to the ceiling in the reception area. The hall opens onto a manicured, Mughal-style garden. On the opposite side of the garden, you’ll find the ladies’ courtyard, where the queen entertained. This hall is decorated in mosaics of pale yellow, blue, and purple. This beautifully-restored fort and palace is worth the visit; plan on one to two hours. Cost: Student about $2; Adult about $8; audio guides are available if you’re not touring with a guide. We also visited the Hawa Mahal in Jaipur. It’s a 5-story, honeycomb-like wall built so that the women of the royal household could observe festivals and parades on the street below without being seen. Yes, its intricate latticework is striking, but it looks exactly like any photo that you’d see online, and in my opinion, is not worth the trouble of driving here. In addition, the City Palace, the other major site in Jaipur, is really not kid-friendly; I’d skip it, too. I’m not a shopper on vacation. But if you are, Jaipur is known as a jewelry center. Just know, shopkeepers see tourists coming. If you’re going to buy here, be prepared to do some serious bargaining. When you hear the opening price, offer 10-percent and let the negotiation begin. That’s largely true of any shopping in India. The dining options are somewhat limited at The Oberoi Rajvilas. Surya Mahal is open throughout the year and offers world cuisine, but I’d strongly recommend ordering off the Indian menu here. The incredibly attentive wait staff is happy to make recommendations. Surya is also where you’ll eat breakfast, which is a combination of a cold buffet plus made-to-order entrées. I’m a big fan of the French toast! You also can opt to eat breakfast in the herb garden during certain times of the year. Inquire about that experience at the front desk. Raj Mahal is another Indian fine dining choice, but it’s only open during the cooler months from October to April as the restaurant is al fresco. Given our trip was in August, we didn’t get to sample. Air service is available to Jaipur from most major Indian cities. The hotel is located about 30 minutes outside of the city center. You also can hire a car service for the 4-hour drive from Agra or Jodhpur. Uber also operates in this area. Headed to Agra and the Taj Mahal? Click here to read our review of The Oberoi Amarvilas. Headed to Jodhpur? Click here. Editor Shellie Bailey-Shah is married to a first-generation Indian-American. This trip was the family’s first opportunity to connect with their Indian heritage. This writer received a discounted stay for the purpose of this review. However, all opinions expressed are solely her own.